The new Tata Zest Revotron takes on its fiercest rivals. But does it have what it takes to withstand the onslaught? The Tata Zest is the newest entry into the red-hot compact sedan segment. 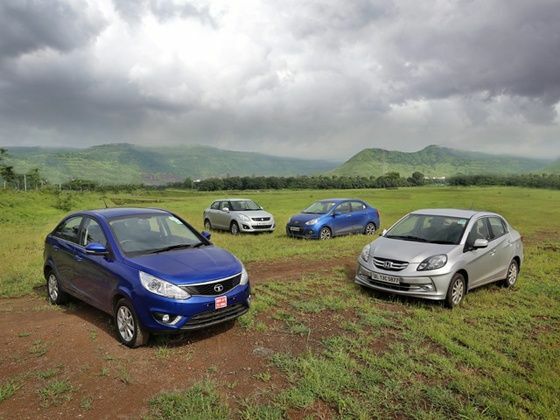 Dominated by the Maruti Suzuki Swift Dzire - which is frequently India’s largest selling car, and the Honda Amaze and the Hyundai Xcent - which are both capable in their own ways - the Zest does have some really tough competition. Can the newest Tata on the block have enough to take on the established players? Read on to find out. Although all four cars have been designed keeping government policies for small cars in mind, each manufacturer has gone about it differently. On the whole, the Honda Amaze might look a little plain, but it does have the most balanced design of the lot. The add-on boot fuses in well with the rest of the car as compared to the rather notch-like Swift Dzire or even the Hyundai Xcent to a degree. The Tata Zest on the other hand certainly looks most striking, especially when viewed from the front with its daytime running lights, its aggressive projector headlamps and its honeycomb grille. The Dzire does seem to look a little aged as compared to the other more modern cars while the Xcent’s rear could certainly do with a lot more tarting up. Viewed from the side, it is a tie between the Zest and the Amaze in terms of a more aggressive design language. The Dzire does look the largest of the lot with its accentuated curves on the bonnet and greenhouse area. All four cars though get a generous helping of chrome both on the front grille and on the boot. While the Zest, Xcent and Dzire come with a set of 15-inch wheels, the Amaze offers only 14 inchers even in the most expensive model. When it comes to interior design, the Tata Zest and the Hyundai Xcent seem to be in a league of their own. That said, all four cars feel well built and exude the quality that is expected of them. All cars come with a two-tone black (or grey) and beige dashboards that appeal to the general Indian car buying audience. The Zest even gets a funky aluminum finish garnish on the dashboard, which we prefer as compared to the likes of the faux wood finish on the Maruti Suzuki Swift Dzire. The Zest, Dzire and Xcent get a digital climate control system whereas the Honda Amaze still gets a conventional knob setup. Tata cars have always had the edge when it comes to interior space, and the Zest is no different. That said, the Honda Amaze still feels the most spacious at the rear with the Hyundai Xcent not far behind. The older Dzire on the other hand does have the least knee space in the rear, which does tend to make it a little uncomfortable. Over to the front, the Dzire and Zest offer the most comfortable seats with a separate adjustable headrest. The Xcent and Amaze on the other hand have slightly narrower front seats but that doesn't seem to really affect driving comfort. All four cars here though do suffer from a slightly claustrophobic rear cabin area due to their sloping window lines resulting in smaller windows. Most hatchbacks and compact sedans now come loaded with the features that were only seen on luxury cars till recently. For example, the Hyundai Xcent comes with a start-stop button, rear view camera and auto folding ORVMs. The Zest isn’t too far behind with features like a large touch screen infotainment system with built-in DVD player, GPS navigation and controls for the air conditioning unit. Even the Amaze, with its slightly older looking dashboard gets features like Bluetooth telephony and media sync. The Dzire scores lowest in terms of features though with no Bluetooth, reversing sensors, etc. All four cars though do get steering mounted audio controls with the ones in the Dzire and Xcent getting a backlit function to them. Over at the back, the Hyundai Xcent is the only car that offers rear AC vents. The Zest does score poorly at the rear in terms of equipment with no fold down hand rest though, a feature that every other car in the segment gets. Ride quality is of utmost importance to the Indian public, especially in an aspirational segment like the compact sedans. Differentiating between the four cars in terms of ride quality is quite simple. Where the Zest and the Xcent offer a slightly more supple and softer ride, the Amaze and the Dzire offer slightly stiffer suspension. As automotive journalists, we prefer the point and shoot abilities of the Dzire among the sedans on test here, but it's the more comfortable ride offered by the Xcent that buyers in this class would most appreciate. The Xcent is also the easiest car to drive around the city with its light controls like the steering. Just as the design of these compact sedans is governed by government policies, so are their engines. With a 1.2-litre cap on engine capacity, the only way to draw more power is through forced induction and that is exactly what Tata has done with the new Zest. That said, all cars are very similarly powered, with the Hyundai Xcent being the least powerful at 81PS compared to the Swift Dzire’s 86PS, the Honda Amaze’s 87PS and the Tata Zest’s 90PS of peak power. Although the turbocharged Zest is the most powerful on paper, it does suffer from very slight turbo lag below 1500rpm. The Dzire and the Amaze feel the quickest, both dispatching the 0-100kmph dash in a smudge under 13 seconds. The Xcent though does feel slightly slower taking 14 seconds to do the same sprint. The Zest, with its two driving modes (that drastically change performance figures) is right in the middle with a respectable 13.5 seconds. Forget figures for a while though. To the lay man, performance is all about how responsive the car feels and both the Dzire and the Amaze seem to get that spot on. The Dzire, Xcent and Amaze also get a very slick 5-speed gearbox with short and extremely precise throws that make driving them a delight. The Zest on the other hand does suffer from that age-old Tata problem, a spongy gearbox, something we expected Tata to address with an all-new car. Both the Honda Amaze and the Maruti Swift Dzire impress with their dynamic ability. Both will make quick directional changes without much of a fuss and will gladly trace a line around a bend. The Dzire's 185 section tyres as compared to the Amaze’s 175 section help here but both do tend to give up earlier than expected and are prone to understeer. That said, both offer a well weighed steering feedback that does not feel too artificial or vague. As we mentioned earlier, the Hyundai Xcent's steering though isn't something that keen drivers will enjoy as it just is not as involving. The softer suspension too makes the Xcent slightly nervous around a corner comred to the others. The most disappointing of the lot though, is the Zest. Although from a handling perspective, the Zest is quite well set up, the all-new electronic power steering seems to completely ruin it. In fact, there is actually a noticeable lag between turning the steering wheel and the car actually changing direction. Tata needs to address this with a more responsive setup and better steering bushes, changes that will hugely improve the Zest’s driver connect. Fuel efficiency is possibly the single most important reason why a majority of the Indian audience buys what they buy. According to ARAI approved figures, the Hyundai Xcent is the most fuel-efficient car in its segment at 19.2kmpl followed closely by the Maruti Suzuki Swift Dzire at 19.1kmpl. The Honda Amaze is pegged at 18.0kmpl with the Zest bringing up the rear at 17.1kmpl. That said, in the real world, we think the Tata Zest would have a slight edge over its rivals due to the extra torque produced by its turbo which in turn would result in more usable power. In India, the sedan is an aspirational product. Although a few thousand here and there should not ideally make a difference in terms of sales, it does. The Tata Zest, the most loaded car in terms of equipment is in fact the cheapest car here at Rs 5.99 lakh followed by the benchmark Swift Dzire at Rs 6.32 lakh (ex-showroom, Delhi) for the top of the line petrol powered variants. The Hyundai Xcent is priced at Rs 6.54 lakh whereas the Honda Amaze is the most expensive at Rs 6.64 lakh (ex-showroom, Delhi). Considering the amount of kit you get as standard on the Tata Zest, there is no doubt that it is the most value for money product here. Crowing a winner between these four cars is difficult but not impossible. Where the newest car here, the Tata Zest is the most value for money buy on paper, on the road it suffers a tad in the refinement and handling departments. The oldest car in this group, the Maruti Swift Dzire on the other hand, might be the highest selling car in the country and might perform well, but lacks severely in terms of standard equipment. The Honda Amaze meanwhile has interior space, good performance and able handling in its favour but it takes a hit when it comes to overall value and interior design. As for the Hyundai Xcent, it might be well put together and well equipped besides being easy to live with and like, but with its lack of driver involvement and an engine that fails to keep up with the rest, it's not perfect either. Share your experiences with Zest?